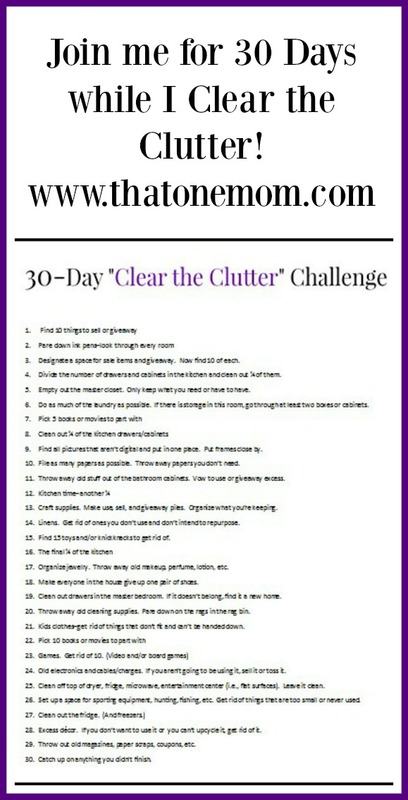 Clearing the clutter is the name of the game right now–especially at the That One Mom household–and that’s why we’re doing a 30-Day “Clear the Clutter” Challenge! We just have so much stuff and it doesn’t matter that a lot of it is boxed up and hidden behind closed doors, I can’t take it anymore. Some days I feel like I’m drowning in it and if you’ve never felt that way, let me tell you, it’s just horrible. I read an article a while back that told how many items the average American household contained and it was around 300,000. That’s just too much. I don’t know how much we actually have, but my goal for this year is to purge as much of it as I can and organize the rest. If I can sell a little of it along the way, that will be a win for my bank account. If I can sell a lot of it, that will be a win for me, because I might just take a vacation!! There are a lot of different ways to approach decluttering and what works for this household may not necessarily work for another. Personally, I like to think of it in terms of packing up and moving. Do I really want to move all of this stuff? I don’t even know what half of it is and we can’t use a lot of it. If you’ve ever moved before, you know what a labor intensive process it is to pack it up, move it, and then unpack it. I’ve done it before and although I’m not opposed to moving, I am opposed to moving a ton of junk. Therefore, it’s going. If we don’t need it or love it, it needs a new home. Although I had a mini-decluttering session with my 10 Days of Organization, I didn’t get completely finished and I needed something more. It’s necessary for me to have a list to follow or else I will get totally sidetracked (sort of like kids do when you tell them to clean their room…only instead of playing with my toys, I start making something or reading a book). I also decided I needed to have a little accountability. Therefore, not only am I going to share my “Clear the Clutter” list with you, I am going to write about my daily struggles triumphs as the challenge progresses! I would love it if you would join me and share how you are clearing the clutter in your life!! I know the print in this graphic is not the biggest, so just in case you can’t see it/don’t want to print it, all of the information is included below. I will also be linking back with each day’s accomplishments so feel free to follow along with that! Find 10 things to sell or giveaway. Pare down ink pens–look through every room. Designate a space for sale items and giveaway. Now find 10 of each. Divide the number of drawers and cabinets in the kitchen and clean out ¼ of them. Empty out the master closet. Only keep what you need or have to have. Do as much of the laundry as possible. If there is storage in this room, go through at least two boxes or cabinets. Pick 5 books or movies to part with. Clean out ¼ of the kitchen drawers/cabinets. Find all pictures that aren’t digital and put in one place. Put frames close by. File as many papers as possible. Throw away papers you don’t need. Throw away old stuff out of the bathroom cabinets. Vow to use or giveaway excess. Craft supplies. Make use, sell, and giveaway piles. Organize what you’re keeping. Linens. Get rid of ones you don’t use and don’t intend to repurpose. Find 15 toys and/or knick-knacks to get rid of. The final ¼ of the kitchen. Organize jewelry. Throw away old makeup, perfume, lotion, etc. Make everyone in the house give up one pair of shoes. Clean out drawers in the master bedroom. If it doesn’t belong, find it a new home. Throw away old cleaning supplies. Pare down on the rags in the rag bin. Kids clothes–get rid of things that don’t fit and can’t be handed down. Pick 10 books or movies to part with. Games. Get rid of 10. (Video and/or board games). Old electronics and cables/chargers. If you aren’t going to be using it, sell it or toss it. Clean off top of dryer, fridge, microwave, entertainment center (i.e., flat surfaces). Leave it clean. Set up a space for sporting equipment, hunting, fishing, etc. Get rid of things that are too small or never used. Excess décor. If you don’t want to use it or you can’t upcycle it, get rid of it. Throw out old magazines, paper scraps, coupons, etc. Catch up on anything you didn’t finish. 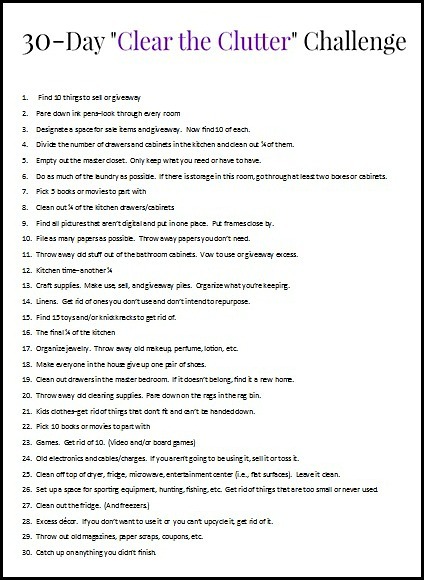 There you have it…30 days worth of decluttering ideas! Some of these may not pertain to you or the order may not work for you. Please feel free to substitute or reorder at will! 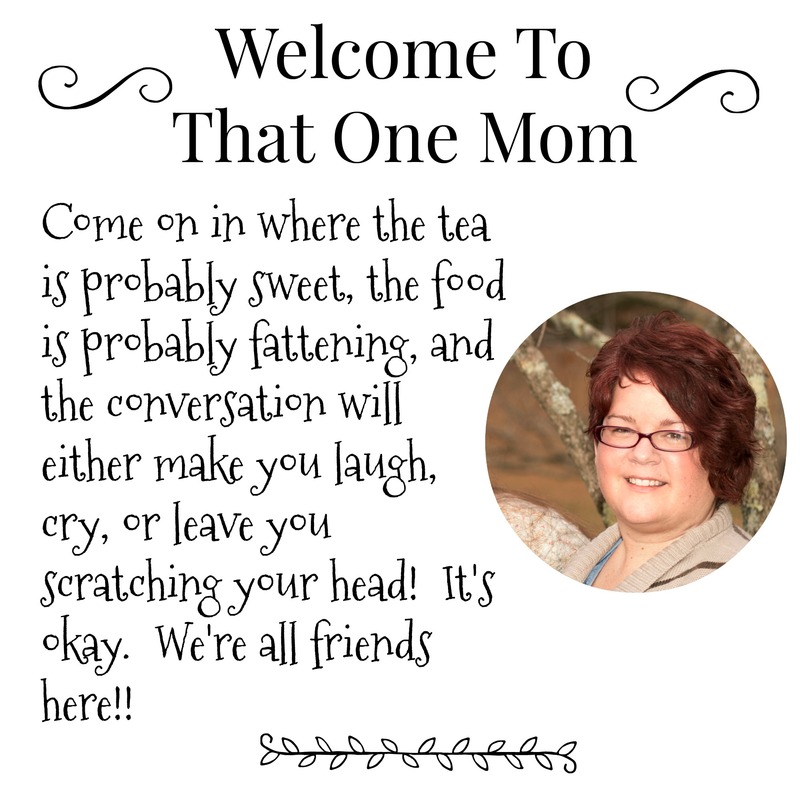 Make sure to let me know how it works out for you and don’t forget to follow along with my progress here at That One Mom! Goodness knows I need this! Lol…I think I could do it 4 or 5 times and still have too much stuff! !